The Argentine boa constrictor, a sub-species of boa constrictor, inhabits the Great Chaco region in Paraguay, central Argentina and Bolivia. These snakes can grow to be over 9 feet long. Their dark brown or black coloration with pale gold or white patterns distinguishes them from other boas. The Argentine boa constrictor is the only boa subspecies listed in Appendix I of the Convention on International Trade in Endangered Species of Wild Fauna and Flora as a critically endangered animal. The Argentine boa constrictor is considered endangered primarily because of reduction and fragmentation of the snake’s natural habitat, according to an article in the International Reptile Conservation Foundation's journal "Reptiles & Amphibians." Argentine boas favor woody areas 2,900 to 3,300 feet above sea level that receive between 10 and 35 inches of seasonal rainfall per year. Many of these wooded areas have been cleared to make way for increased farming and to graze livestock. Since 1987, when the Argentine boa was listed in CITES Appendix I, such activities have reduced the snake’s habitat by nearly one third, the 2012 "Reptiles & Amphibians" article reports. Being listed in Appendix I helps Argentine boa populations to recover. CITES only allows trading of Appendix I species that is for non-commercial purposes and is not detrimental to the survival of the species. Even then, mandatory inspections must certify the recipient has adequate facilities to house and care for the animal. Before it was included in Appendix I, tens of thousands of Argentine boas were traded in the skin trade. In the years after CITES protection, field researchers have determined the species no longer has any commercial value in the regions it inhabits. Although Argentine boas grow quite large, they are easy to keep and only moderately difficult to breed. Captive-bred boas are not subject to CITES regulation, and captive breeding of the Argentine boa has been successful in the United States. 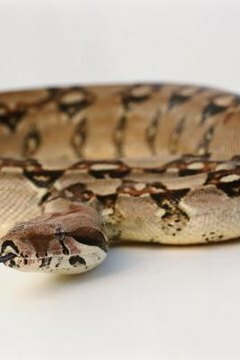 Argentine boas do not require any specialized breeding conditions compared to other boa constrictors, and most babies will accept mice on the first feeding attempt. Each successive generation acclimates quicker to captivity and becomes less demanding to breed. As of 2013, the Argentine boa remains on the CITES list of critically endangered animals. Although CITES was effective in virtually eliminating the trade value of the snake’s skin, the demand for and value of those skins would increase if CITES restrictions were removed, "Reptiles & Amphibians" reports. Argentine laws to preserve native forests, effective from 2009, should work to slow habitat reduction. The Argentine boa is relatively common in its range, but will remain endangered as long as suitable habitats continue to deplete.